Overall, the Rush 40th Anniversary Tour was a great show. That said, I had my issues with the show as well. This post is a review of the experience, covering virtually everything that I can think of about the show. 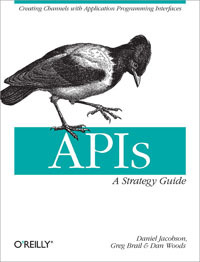 My Book - "APIs: A Strategy Guide"
Description: Programmers used to be the only people excited about APIs, but now a growing number of companies see them as a hot new product channel. This concise guide describes the tremendous business potential of APIs, and demonstrates how you can use them to provide valuable services to clients, partners, or the public via the Internet. You’ll learn all the steps necessary for building a cohesive API business strategy from experts in the trenches. Facebook and Twitter APIs continue to be extremely successful, and many other companies find that API demand greatly exceeds website traffic. This book offers executives, business development teams, and other key players a complete roadmap for creating a viable API product.